J Type and Chisel hive tools are the two of the most popular and the same ones we use ourselves. 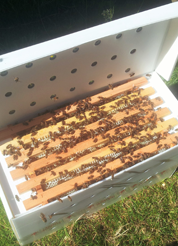 The J type hive tool is fashioned with a J at one end for levering up the frames. The other end is squared off and bevelled to act as a scraper and lever. This J type comes with a hole in it so you can hang it on a nail in the garage or wherever you store your hive equipment and one end is painted red so it can be easily seen if dropped at the apiary. Total length of J type 10.5 inches. The chisel hive tool works in the same way but instead of a J end it has an angled end that can be used for levering. The other end, as with the J type is squared off and bevelled to act as a scraper and lever. This hive tool is 9.5 inches long and is also red on one end.